For Memories, section 1, click here, section 2, click here, section 3, click here, section 4, click here, section 5, click here, section 6, click here, section 7, click here, section 8, click here ,section 9, click here and section 10, click here. Jim is circled. Standing right to left are Ray Pushie, Chief Purser, Jim Cook, Chief Steward and Captain Ian Saunders. Do you know any of the others for inclusion in future updates - and the year of the photograph? Please let the webmaster know. See below for more names. We are grateful to Michael Baston for this Queen of Bermuda New Year’s Eve photograph from his late father’s collection. 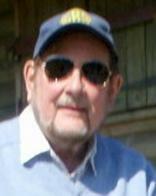 Inset, Jim Baston shortly before his death in December 2014. 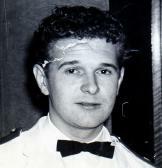 ‘The 1957 photograph (right) from the National Sea Training College at Gravesend includes at least one colleague, Tony Mason. 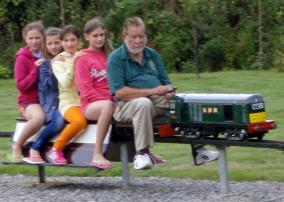 If you can name anyone in Janet’s photographs, please let the webmaster know. Janet says, ‘My brother David, also known as “Benny” Goodman, served on Queen of Bermuda from 1958 to 1965, initially as a bellboy and then steward. David, together with Gerry Herbert, Tony Fricknell and Robbie (?) 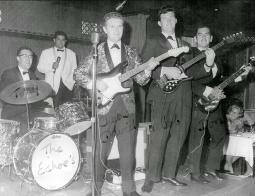 were members of The Echoes band, which played at the 40 Thieves Club when the ship was in Hamilton (right). Janet Twidale (left) has contacted the website about her brother, David Goodman (right). 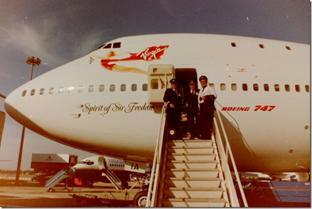 Anne Boulton (left) was Leading Stewardess on Ocean Monarch for many years. Her son, Neville, has contacted the website with his memories of meeting up with her during his own travels. ‘My father, Richard Boulton, who was wounded in France while serving with the Liverpool Regiment during the First World War, met my mother when recovering from his injuries in Liverpool in 1918. After the war, my dad got a job as a bell boy with Canadian Pacific on Empress of France, progressing to the Empress of Britain as a Bedroom Steward. The ship was sunk by enemy action in Liverpool Bay around 1940/41 and so we moved to Stockport where he became part of the ‘World War II war work’ programme at Fairy Aviation. In 1949, Dad died of cancer when I was a pupil at Liverpool Collegiate and hoping to be a marine engineer. 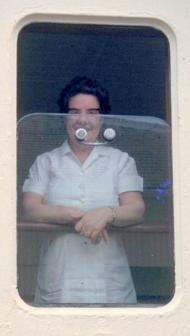 Mum got a job as a stewardess with Cunard and I became an Artificer Apprentice in the Royal Navy at the age of 16. Mum served on Georgic and Queen Mary. 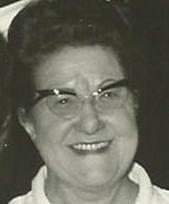 Sometime in the 1950s, Mum, with her boyfriend Don (Mac) McAllister left Cunard and joined Ocean Monarch . 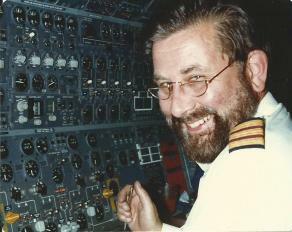 By 1958, I was an Royal Navy Aircraft Artificer at RNAS Eglington working on Fairy Gannet aircraft when BOAC offered me a job as a flight engineer officer on Britannia 312 aircraft – I managed to buy myself out from the Navy with a £200 loan from my Mum. On my first flight in 1959, I went to New York, Jamaica and Bermuda where Mum and Mac met me at the airport. In 1964, I moved to Super VC10s and would meet up with them at the Lexington Hotel in New York City. In those days, communications were rather primitive and the best way to communicate with her was using the aircraft VHF to relay a messages via ocean weather ships direct to Ocean Monarch at sea. Whenever I managed to visit Mum on board, I would always bring along the day’s newspapers, one for the Master at Arms, The Telegraph for the Captain and a selection for the crew in the Pig & Whistle crew bar. [many of us remember reading the papers in the Purser’s Office too! - Ed.]. Mum even placed an order with me for a re-conditioned Hoover. Apparently they were the only ones that would work on the ship’s DC electrical supply. I was to run her personal air freight service to the UK and, over the years, I shifted vacuum cleaners, vases, glasses, bed sheets and cutlery – you name it! 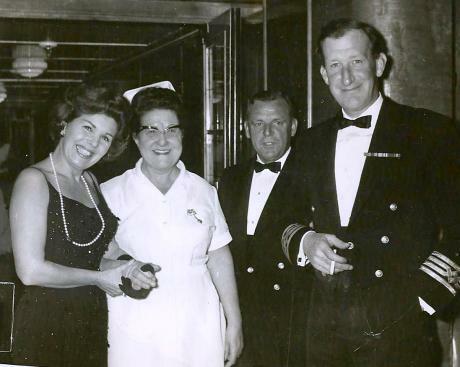 Anne seen between, Captain Ray Marshall and Mrs Jessie Heys, wife of Staff Captain Ginger Heys (right) on Ocean Monarch. When Furness Bermuda Line sold Ocean Monarch, Mum retired to live with her brother, Charles, in North Wales. In July 1977, I took them to Montreal to see her sister Hilda. On the flight, I had a brief word with our Cabin Service Director, who re-located Mum in the First Class Cabin. After an hour or two, the Cabin Services Director came up to me on the flight deck and said something along the lines of “Nev, your Mum has gone through nearly half a bottle of gin”. I replied “You do know that you are talking about the Ex-Chief Stewardess of Ocean Monarch?”, “Goodness” he said, “I’ll go and get a fresh bottle”. This photograph has provoked a lot of interest. 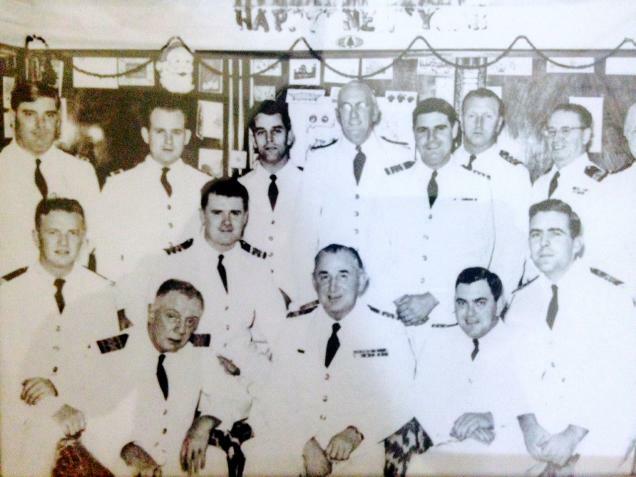 Allan Davidson, former Junior Chief Officer, tells us that Allan Watson, Chief Electrician, is standing next to Captain Saunders and Captain Banyard is seated below him. Bob White, former assistant purser, points out that ‘Flash’ Gordon, Chief Engineer is seated on Captain Banyard’s right hand side. Ron Jones confirms that it is ‘Flash’ Gordon and adds that Les Gray, Assistant Purser, is in the front row. Phil Baston then told us that on his own copy of the photograph, the banner is clearly seen and reads “Happy New Year 1957”. 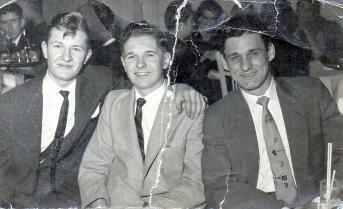 Following the release of this story, Ian Bray (right), a former bellboy with Furness Bermuda Line in the 1960s (left), contacted the website with his memories of ’Benny’ Goodman. He also recalled visits with Benny to The Forty Thieves Club on Front Street in Hamilton. ‘Of course, this was our well known hang out and who can forget their famous tall drink, the “Zombi”. I remember it contained every sort of rum one could think of and was topped off with pineapple juice. I also recall that Benny played as a back up guitarist for Tom Jones when he played the club early on in his career’. ‘Benny and the band also played at the “El Matador” club where one went down into a cellar. It later became a key only club’. ‘Benny had one of the best collections of war time songs, such as “She was coming round the mountain doing 90 miles an hour” and “When the chain on her bicycle broke”, with many, many similar songs from the RAF, Royal Navy and the Army. Fond memories......Thanks for bringing them back’. Ian’s birthday party in 1963 (left).